As one of reed musical instruments, cucurbit flute is especially popular among the Dai people in Dehong. 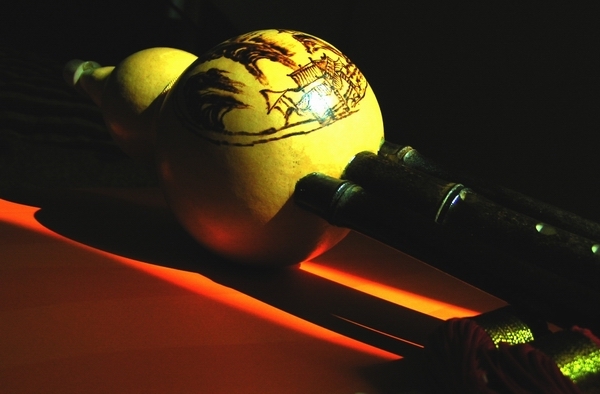 The instrument is made with natural materials of gourd and bamboo. Composed of a gourd, main pipes, reeds and auxiliary pipes, the cucurbit flute sounds beautiful. It is ideal instrument for young people to express their emotion. Boasting of elegant appearance and sweet sound, the cucurbit flute has been passed down from generation to generation among the Dai people. During festivals, accompanied by the sweet tunes of cucurbit flute, the versatile Dais sing songs and dance. Lianghe, a county in the southwest of Yunnan, is home to cucurbit flute. As the birthplace of the instrument, Lianghe boasts of splendid history, rich ethnic customs, beautiful sceneries and abundant delicacies. The mysterious land and profound culture have raised several masters of cucurbit flute who produced such classical pieces as Bambusa Multiplex under the Moonlight, The Depth Bamboo Groves and A Beautiful Place. Nowadays , the cucurbit flute has enjoyed increasing popularity home and abroad. Attracted by the instrument, people of different ages attend the training classes. Many Burmese living in China are also fascinated by the elegant, sweet-sounding and portable instrument.